Jeffrey Steven Pilson (born January 19, 1959) is an American musician who is currently the bass guitarist for the rock band Foreigner. He has also performed with bands Dokken and Dio. He also plays guitar, cello, keyboards, piano, and mellotron. Pilson played fictional heavy metal bassist Jörgen in the 2001 film Rock Star, and voiced Johnny Cage in the 2011 video game Mortal Kombat. Pilson was born in Lake Forest, Illinois and spent part of his youth in Milwaukee, Wisconsin before moving to Longview, Washington, where he graduated from R.A. Long High School in 1976. He attended the University of Washington to study music after he had started playing bass at age 13 but left without a degree in order to pursue a career in music. One of his early bands was an Emerson, Lake & Palmer type progressive trio called Christmas. He moved to San Francisco in 1978 where he met up and became friends with guitarist Mike Varney. Varney and Pilson would join forces in the band Cinema. After moving back to Seattle for a brief period, Varney called Pilson to get involved in the recording of Rock Justice, a rock opera co-written by Varney and produced by Marty Balin. Still based in San Francisco, Pilson next teamed up with guitarist Randy Hansen, best known as a Jimi Hendrix impersonator, and Pilson recorded the Astral Projection – Live album with Hansen for Shrapnel Records. When the band with Hansen dissolved, Pilson moved to Los Angeles and only weeks later, on a recommendation by Mike Varney, was contacted by vocalist Don Dokken who was looking for a bass player for his band Dokken. An audition was set up and Pilson joined the band in 1983. Becoming a vital member of the band from the get-go, Pilson was co-writer on many of Dokken's best known and most successful songs, including Just Got Lucky, Alone Again, Into the Fire, The Hunter, In My Dreams, It's Not Love, Kiss of Death, and Dream Warriors. Pilson recorded the studio albums Tooth and Nail (1984), Under Lock and Key (1985), and Back for the Attack (1987), all certified platinum, and the gold certified live album Beast from the East (1988). After the break-up of Dokken in the wake of the Monsters of Rock Tour 1988, Pilson, along with Randy Hansen, Vinny Appice and Michael Diamond of Legs Diamond, formed his own group called Flesh & Blood in 1989, handling lead vocal and rhythm guitar duties. After changing the name to War & Peace, Pilson released a total of four albums, starting with 1993's Time Capsule, utilizing different players and line-ups along the way. Pilson went on to collaborate with War & Peace bassist Tommy Henriksen, now with the Alice Cooper band, under the name Underground Moon choosing the pseudonym Dominic Moon for himself; the project's sole album was released in 2001 in Europe and Japan. In the early 1990s, Pilson also worked as a session bassist with the band Wild Horses (not to be confused with the British band of the same name), guitarist Michael Lee Firkins, and MSG, before taking part in the Dokken reunion which resulted in 1995's Dysfunctional album. It was followed by the semi-acoustic One Live Night (1995), the controversial Shadowlife (1997), and Erase the Slate (1999), Pilson's last studio album with the group. During the 1990s, Pilson also recorded and toured with Dio, appearing on both Strange Highways (1994) and Angry Machines (1996). In 1993, Pilson collaborated with former Giuffria and Dio guitarist Craig Goldy, co-writing and contributing lead vocals to 4 songs on Goldy's first solo album, Insufficient Therapy, issued on Shrapnel Records in 1993. During that time, Pilson, Goldy and drummer Tim Pedersen also had a heavy progressive rock project named 13th Floor although no album was ever released. On the heels of Underground Moon, Pilson reunited with his ex-Dokken bandmate, guitarist George Lynch, in a project called Lynch/Pilson, releasing the album Wicked Underground in 2003. After a proposed Dokken reunion did not materialize, Pilson re-teamed with Lynch and drummer Mick Brown in Tooth & Nail, later shortened to T & N in 2011. They would release Slave to the Empire, an album of re-worked Dokken songs and new material involving a plethora of guest vocalists in the fall of 2012. Pilson was also confirmed as the bass player on the Lynch Mob's forthcoming 2015 studio release. 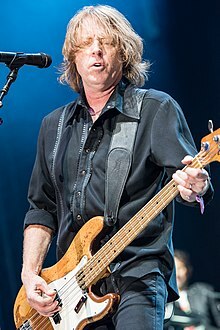 Pilson became the bass player for Foreigner in the summer of 2004 when he asked to join an impromptu line-up consisting of founding member Mick Jones, Jason Bonham, Jeff Jacobs, Thom Gimbel, and Bonham singer Chas West for a benefit show for Muscular Dystrophy on July 25, 2004, in Santa Barbara, CA at Fess Parker's Doubletree Resort. West would be replaced by Kelly Hansen, formerly with Hurricane, who made his debut with the group on March 11, 2005 at Boulder Station in Las Vegas. Pilson has been part of every Foreigner recording and tour since, including the 2009 studio album, Can't Slow Down. During some reunion tours, Pilson played the guitar when Rick Wills plays bass. In addition to producing his own projects starting with War & Peace, Pilson has also worked in that capacity with several other acts, helming Benedictum's Uncreation (2006) and Seasons of Tragedy (2008), respectively, and Adler's Back from the Dead (2012). He produced Foreigner's 2006 CD, Live in '05, as well as tracks off of their 2008 No End in Sight release as well as their most recent effort, The Best of Foreigner 4 & More (2014). He returned as producer for Benedictum in 2012 for their fourth album, Obey (2013). In December 2012 it was revealed that Pilson would produce the second album by Kill Devil Hill, featuring Pilson's former Flesh & Blood and Dio band mate Vinny Appice on drums. Pilson also wrote all but two songs and produced the latest Starship feat. Mickey Thomas album, Loveless Fascination (2013), the group's first new studio release in almost a quarter century. As of late 2014, Pilson had resumed production work on the debut album by Last in Line, a band featuring original Dio members Vinny Appice, Jimmy Bain, Vivian Campbell, and Claude Schnell, which is due out in 2015. Pilson has also worked as an actor, having appeared in the movie Rock Star, 2001. Pilson played bassist Jorgen, of the fictional band Steel Dragon, along with Zakk Wylde, future Foreigner band mate, Jason Bonham, who also contributed to the Soundtrack, with Miljenko Matijevic and Jeff Scott Soto as vocalists, who can not be seen. He also contributed to the Mortal Kombat reboot, performing the voice acting for Johnny Cage. Pilson's current bass is a 1973 Fender P-Bass with '66 pickups running through an Ampeg SVT. In the studio Pilson runs all of his basses through Ampeg SVTs, as well as the Ampeg SVX plug-in from IK Multimedia. ^ Carrie Pederson (July 6, 2008). "Homegrown: Jeff Pilson Has Enjoyed A Lengthy Career As A Juke Box Hero". TDN.com. ^ Leslie Michele Derrough (April 14, 2013). "Jeff Pilson Interview". GlideMagazine.com. ^ Rich Suchow (June 1, 2013). "Foreigner's Jeff Pilson: Rock Journeyman". BassMusicianMagazine.com. ^ Kevin J. Julie (2000). "An Exclusive Interview with Dokken's Jeff Pilson!". Universal Wheels. ^ "Jeff Pilson: "Mick Brown, George Lynch And I Are Going To Make A Record"". LiveRockJournal.com. October 19, 2011. ^ "Current And Former Dokken Members Launch Tooth And Nail". Blabbermouth.net. December 17, 2011. Archived from the original on September 11, 2012. ^ "T&N Featuring Three-Quarters of Dokken's Classic Lineup: Two Songs Available For Streaming". Blabbermouth.net. October 4, 2012. ^ James Wood (December 16, 2014). "'Only to Rise': George Lynch Talks New Album with Michael Sweet, Plus Lynch Mob and Dokken". GuitarWorld.com. Archived from the original on June 27, 2015. Retrieved June 28, 2015. ^ "Benedictum And Jeff Pilson Join Forces Again". BraveWords.com. April 19, 2012. ^ "Kill Devil Hill Recording New Music With Producer Jeff Pilson". Blabbermouth.net. December 18, 2012. ^ James Wood (August 22, 2013). "Foreigner Bassist Jeff Pilson Talks New Starship Album, T&N and Dokken". GuitarWorld.com. ^ Dan Reilly (June 28, 2013). "Starship Working on New Album, 'Loveless Fascination' – Frontman Mickey Thomas Collaborating With Foreigner's Jeff Pilson". RollingStone.com. ^ "Vivian Campbell's Last in Line Resumes Work on Debut Album". Blabbermouth.net. December 7, 2014. Wikimedia Commons has media related to Jeff Pilson. "Growing Up the Hard Way"